Any Square seller, from mobile businesses to multi-store retailers, can easily open an online store, list products for sale, accept orders, and process payments. Best of all, it happens within your Square POS system—a free Square online store is included with your free Square account. Here’s how to set yours up today. Square’s free online store is remarkably simple to set up and we’ll walk you through it eight simple steps. If you want to follow along, sign up for your free Square account now. It takes just minutes, is completely risk-free, and you can build your store as quickly as you can read this guide. You need to have a free Square account to set up your free Square online store. This account gives you access to the Square dashboard, which is where the online store controls reside. The only information Square asks for in this step is your email address and password, as shown in Square’s sign-up form, below. If you decide that Square is the right solution for your online store and other sales, then you can finish the full setup later on. But to just test drive the online store and Square’s many other sales and business management features, a quick signup is all you need. Click here to get your free Square account. 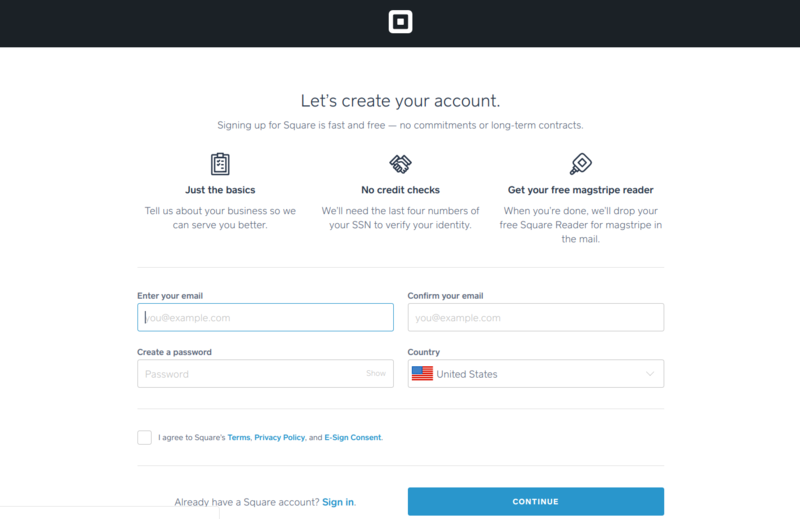 Once your account is set up, log into your Square dashboard using the email address and password entered in Step One. In the dashboard, click on Online Store. Once in the Settings Screen, under Store URL, you can add or change the name of your store. Using this name, Square automatically gives your store a website address, called a URL, which is housed under the main Squareup.com domain. This automatic Square URL can be a lot for customers to remember and type. For easier marketing, and better branding, we recommend buying your own store domain. You can easily do this within this screen by toggling on Use a Custom Domain and then clicking on Purchase New Domain. Square automatically connects you to Google Domains without leaving your Square dashboard, as shown below. In this box, you can search available domains that match your store name. We recommend choosing a .com for businesses, but other extensions like .net and .info are available too. When you’ve found the perfect store URL, can purchase it for around $12 per year through Google Domains. Or, if you already have a web address from Bluehost or another domain registration service, you can direct it to your new Square online store. Simply follow the directions in the Learn More link under Use Custom Domain. Once your Square online store URL is set up, you need to complete a few key details in the Settings screen. If you’re going to ship or deliver orders placed online, then you need to set up shipping or delivery details and any related fees. You’ll set up these charges in Settings screen under Shipping Settings. If the price of the items you sell online includes a markup to cover shipping or delivery, you can just select Free Shipping. Hint—customers like free shipping, so learn how to create cost-effective shipping promotions in our free shipping guide. Flat-Rate Shipping Fees – Flat-rate shipping adds a single surcharge to every order, no matter the total value. Per-Item Shipping Fees – Per-item shipping charge adds an additional shipping fee when that item is ordered. Per-item fees are entered when you set up your products, which we detail in Step 6. Flat-rate fees are set up in this screen. To do this, select Flat Charge and enter the amount that you want to add to every order, as we did by entering $5.95 in the field below. Here you also can state your Ship Within days, which covers the time you need to prepare and pack orders. This way, customers know it takes the stated number of days before their order leaves your location. We selected “3 days” in the field below. If you offer In-Store Pickup, you can set up those details in the same screen, underneath the Shipping Settings, shown below. Here you also can elect to automatically accept orders—or not—as they’re placed. This gives you the option to review an order before it’s approved to process and ship. This might be needed if you make custom goods or have stock issues. Otherwise, automatic approval is the easiest choice. Once your Square store is complete, you can connect your Square POS system to ShipStation to easily process your orders and print shipping labels for USPS, UPS, FedEx, and more. Now we’ll finish up our settings tasks by adding two final bits of information to our Square online store—Return Policy and Business Hours. Next to your shipping settings, you can elect to display a Return Policy and include a brief description of your terms. This policy appears on your online product pages, checkout screen, and on printed order receipts. You also need to enter your Business Hours. These times can represent your store hours or extended customer service hours for online shoppers. Once your Settings screen work is complete, it’s time to design and populate your free Square store. Square makes it very easy to set up your store’s design. Start by selecting Edit Store in your online store dashboard. Your first store design task is to select the theme, or design, for your store. Do this by clicking Change Theme at the top of your store editor. The next screen displays four store themes to choose from. We used Atlas for our Square online store. You can try out different Square online store themes as you design your site and change to a new theme any time after your site is launched. The settings and products cleanly translate to any of the four themes, so you don’t have to start from scratch to try a new look. If you already have good images to use in your Square online store, you can resize them online for free using Canva. It’s always a good idea to shoot some original product shots to make your online store unique. Learn how to capture great product shots using just your cell phone camera in our product photography guide. If you have a logo, you need to match the size to your theme specifications, too. If you don’t have a logo, don’t worry—you can insert your store’s name as text. If you want to try designing your own logo, check out our top picks for logo design tools. You can also get image and logo help from the pros—even on a tight budget. The talented freelancers on Fiverr are ready to help with product shots, image resizing, and custom logo design. Per-project fees start at just $5. Next, upload your main image into the Feature Image space. This becomes your store’s main home screen image, shown below. Next, scroll to the bottom of your Store Editor screen. In this area, you can upload two product images, shown below, to appear beside your Location, Contact, and Business Hours. This information is automatically inserted from your store settings—very convenient. And that’s all there is to it—your free Square online store settings and design are complete. You’re just a few steps away from launch. Like practically everything else Square-related, adding items to your free Square online store is a breeze. In Square, all of your products are tracked within a central Item Library. So no matter where you sell an item—in-store, online, or both—your item data and sales are tied together seamlessly within your Square POS. This centralized product management makes it very easy to add products to your store, list some or all items for sale online, and change those settings as needed. We run through the process for each option below. For more details on adding items and managing your product library, see the online tutorials in your free Square account. If you already have items listed in your Square POS library, head to your Online Store Editor. Underneath your header image, you’ll see that Square has automatically inserted the first Section in your store. We’re going to list goods for sale, so we click on Goods or Services; then this screen appears. The next instruction is Add or Import Items—when clicked, this screen appears. Create New Item – This lets us add an entirely new item to our Square library and to our online store all at once. Import from Library – This lets us add an item to the online store that already exists in the Square item library, but isn’t in the online store yet. First, we’re going to import an item from our existing Square item library. When we click on Import from Library, this screen appears. In this window, Square lets you simply toggle items on and off to control whether or not they appear in your online store. Toggle an item on and it’s added to your online store—off and it’s removed. It’s that easy! To add items directly into the Square online store, use the Create New Item option. When clicked, this screen appears. Here you can add an entirely new item into your Square item library and online store all at once. After entering several products, you can sort products, create new sections, and even rearrange sections as needed. As we mentioned earlier, Square is a very simple, one-page online store. All of your items list on one page, but you can sort them into as many sections as you please and arrange section rows any way you wish. A new section appears on the store page. Simply follow the steps covered above to add products and any additional sections. Square lets you add up to 100 items in each section, and there’s no limit on the number of sections you can display. Once you’ve created several sections, you can rearrange the order by hovering your cursor over any section, then clicking the up/down arrow box. The screen below will pop up. In it, you can click-and-drag rows to rearrange sections however you wish. With your store settings, design, and products in place, there’s one important tidbit left to complete before you launch your new Square online store—adding social media links. 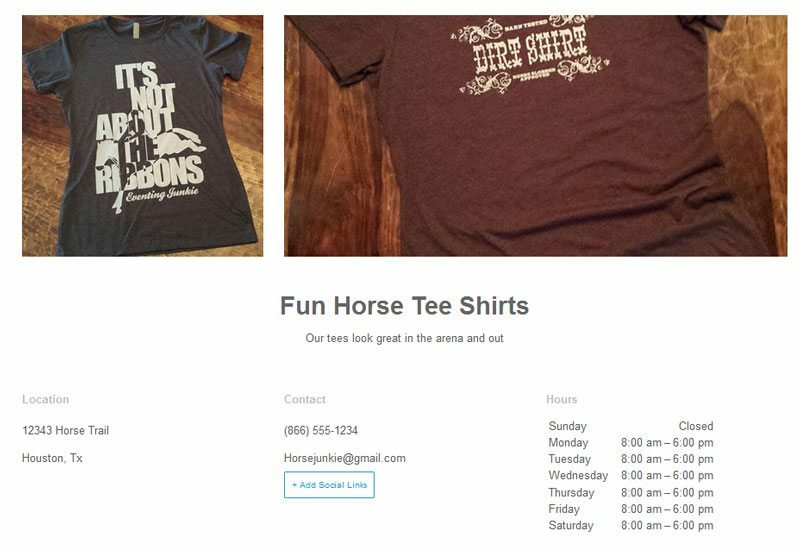 Social media sites are powerful marketing tools, and your Square online store lets you connect your accounts so they display in the footer section of your Square online store. To do this, scroll to the footer section of your Store Editor and click on Add Social Links. This opens fields for you to enter your Twitter, Facebook, Pinterest, and Instagram account links. Whatever accounts you enter will appear as a Follow Us link. To learn more about the power of social media marketing for your business, check out our guides to Facebook and Instagram marketing. When your Square online store setup is complete, and you have a few items loaded into your store for sale, you’re ready to Go for Launch! Scroll to the top of your Store Editor and click Launch. Your store will be live and ready to accept orders within seconds! You’ll see this in your Store Editor screen once complete. And that’s it! Your free Square online store is live and open for business. Next, you’ll want to put the word out about your new online store. The easiest way to do that is to use your social media channels. You can also use the built-in customer engagement tools in your Square POS—like Square’s integrated email marketing feature. Learn all about Square’s suite of marketing and business management tools in our guide to Square services. The free Square online store is a terrific solution for Square users and any online sellers who don’t need a complex ecommerce solution. Setup is swift, product entry and inventory tracking is seamless via your Square POS system, and the finished look is clean and modern. Best of all, Square automatically ties your in-store, online, and mobile sales within one tidy system. Open you free Square account and launch your multi-channel business today. Need more online sales power in a Square-friendly ecommerce platform? BigCommerce is the ideal solution. It delivers a complete ecommerce package including a robust website with built-in shipping, customer service, and marketing tools, plus lets you easily sell on Facebook, Amazon, Pinterest, Instagram, and more. Best of all—it integrates with Square Payments and POS to tie online, in-store, and mobile sales within one seamless system. Try BigCommerce for free for 15 days.